Dusseldorf flight ends up in Edinburgh! British Airways flight accidentally lands in Edinburgh, Scotland. British Airways flight BA3271 destined for Dusseldorf, Germany, was mistakenly flown from London City Airport to Edinburgh instead. 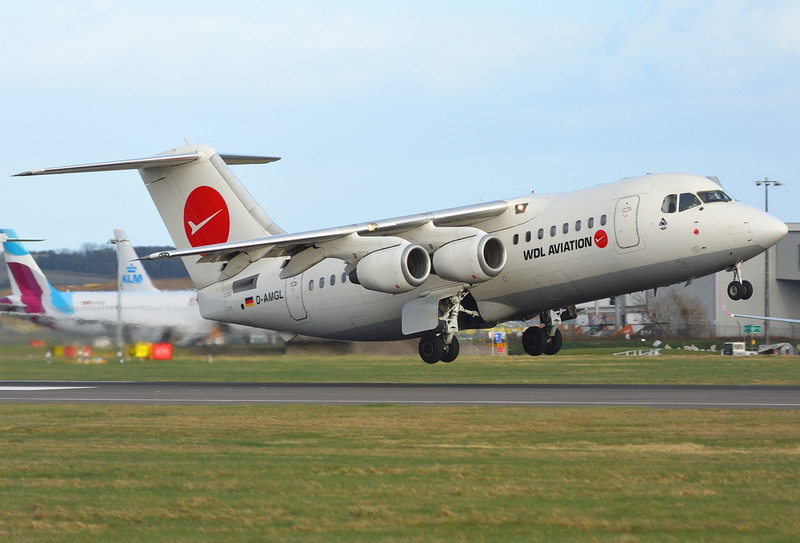 Departing out of London City Airport, the British Aerospace 146 (BAe 146-200) operated by a German aircraft leasing company named WDL Aviation, was scheduled to take the 291 mile flight to Dusseldorf. Taking off over the city, then across the English Channel onto mainland Europe, the aircraft made a short journey into Edinburgh, 500 miles away from its expected destination. 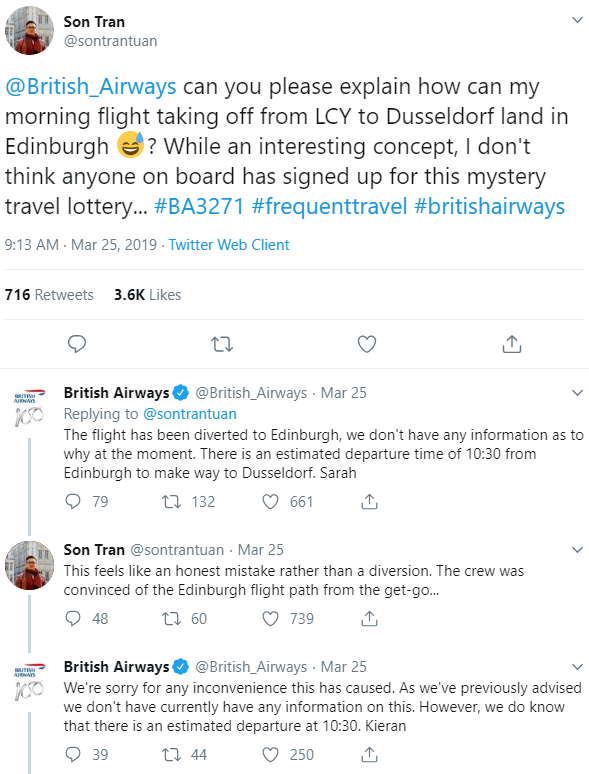 According to British Airways, who tweeted out to their customers, reported that the flight plan was filed incorrectly, and the pilots and passengers only realised they were in Scotland instead of Germany upon landing when the pilots announced "Welcome to Edinburgh". The German firm, WDL Aviation, in-which British Airways has been wet-leasing the aircraft said it was "working closely with the authorities to investigate how the obviously unfortunate mix-up of flight schedules could occur." British Airways is working with WDL Aviation to find out the reasoning for the incorrectly filed flight plan. The final flight on Sunday 24th March 2019 flown by the aircraft was from Dusseldorf to Edinburgh, and back again. - For this issue to have happened, a WDL Aviation employee put in the Edinburgh flight plan into the aircraft's computers for the next day flight. The crew on board the flight from London City airport on Monday reportedly saw that the flight plan was filed for Edinburgh, but they followed to old route instead. One passenger, Sophie Cooke travels from London to Dusseldorf each week for work as a management consultant. When the pilot announced they were landing in Edinburgh, most passengers assumed it to be simply a joke, and many asked the cabin crew if it was serious. After landing, the pilot asked all the passengers if they expected to land in Dusseldorf, and asked them to raise their hands. - Every passenger raised their hand. 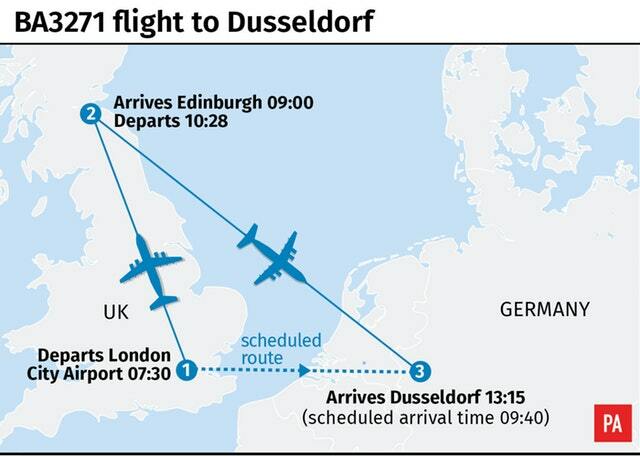 The aircraft was sat on the tarmac at Edinburgh airport for two and a half hours before they flew onto Dusseldorf, 500 miles away in the wrong direction. (See Below Image of British Airways flight BA3271 on Monday 25th March 2019).